It has been raining political analysis, misplaced opinions, and whatnot, specially from the foreign press, leftists and what not who just learned how to place Venezuela on a map (if that much). Let's take it in an occamish manner and answer a few questions (keeping in mind idiocies spewed from the left, the leftist press as the worst offender to one's intelligence!)). He is the president of the National Assembly. Following a complex set of events he has become "presidente encargado" which does not have a good translation in English so we will settle for interim president. Guaidó comes from the party Voluntad Popular, which is affiliated with the Socialist International of which it is one of the two full fledged Venezuelan members (along Accion Democratica). Thus the first correction requested to many: Guaidó is not extreme right. Thank you very much (I am looking at you French TV5). No. Since January 10 he is interim president. It is automatic, no need for a formal swear in since he was already sworn in on January 5. What he did yesterday was to officially accept the responsibilities of the office. There is NOTHING "auto" here (I am looking at you DW). Is the Venezuelan opposition in full behind Guaidó act yesterday? You bet it did! In fact it hurt so bad that chavismo is just reacting and not taking the initiative. Otherwise Guaidó would already be in jail. Who hurt even more was an hysterical foreign left, going as far as pretending that a video of the opposition yesterday was in fact a march supporting Maduro. And I am not talking about the US hysterics, worse than the European ones. We must recognize that Senator Sanders official communique is what a democratic left should do: condemn sternly the abuses of the Maduro regime while detracting Trump's action. The hysterical left in the US do not even deserve Sanders (I am looking at you Bay Area yellow press, MORENA left wing thinkers). Which is of course the argument of the hysterical left (democratic left like Sanders or Social democrats in Europe do criticize Maduro and do not call Guaidó a coup). The answer is very simple: the tanks in the streets are those of the dictatorship. The people killed in the streets are protesters anti regime. The regime is only supported by non democratic regimes (China, Russia, Turkey, Cuba ...). Please, do enlighten us as to why Guaidó actions are a coup d'état. It was not (I am looking at you Canada's NDP, Spain's PODEMOS and IU). Have chavismo and Maduro kept popular support? 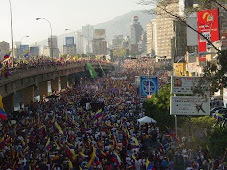 What was the lightning point for Maduro to see "his" people begin to rise against him? Very simple. If you want to set up a political blackmail system where you give cheap goodies in exchange for your vote you better make sure you are in position to keep the goodies coming. Maduro cannot provide anymore. The vaunted CLAP food boxes program has decreased in quality, quantity and timeliness. And hyperinflation is, as usual, affecting the poor above all other social groups. It just required a spark to start the fire. The powder in the keg had dried up long ago (I am looking at you, chavista media). Why is there already a couple dozen deaths in popular zones when there is none in the traditional opposition areas? The regime has allowed, since Chavez time, the formation of armed paramilitary groups while there was an increase unchecked delinquency growth in popular areas so as to secure control. Once some those groups become discontent, the repression is mortal combat. In the traditional opposition areas, there are no weapons because Chavez took them away long ago (I cannot look at anyone, that issue is dodged by all). Who will overthrow Maduro, finally? Technically at this time only full uprising in popular areas could do that. We educated civilians have tried the democratic way and failed, more than once. Thus the final solution rests within the army. Option 1: repress popular areas to keep power and risk to have to make hundreds, if not thousands of victims, risking to go into a civil war escalation. Option 2, negotiate with Guaidó team and have Maduro go into exile. It is to be noted that there are deep but hidden divisions within chavismo. So this one need to negotiate internally before it can negotiate externally (is it worth looking at someone?). How can you force the army to negotiate? First you need to remember that those in power in Venezuela have long ago ceased to be socialist politicians. It is now a mafia structure that dabbles heavily in drug traffic and use a left langage only to justify their rule. Such people, and I include the Venezuelan army in that damaged lot, only understand the language of force. Thus the recent strategy of the opposition, to legally curtail the financing means of the regime, the security of their stolen holdings, with the help of foreign countries. There is not mistaking that strategy when already Switzerland has recognized Guaidó. The "force" that is deployed against the regime has three facets: to capture the thugs cash, to limit their blackmail activities, to restrict the number of places where they could find asylum (the Lima group and the accusation in front of the International Penal Court at the Hague are along that line). Can Guaidó and the opposition speed up the process? Not much, what they could do is just done. Their strategy now is to make sure Guaidó remains free (remember that the regime has not dared yet to capture him). Freedom, or hidden in a friendly embassy, allows Guaidó to legally keep signing decrees that will affect the finances of the regime, decrees that enough countries will be only to happy to honor. But the real solution now is a deal between Venezuela's main creditors, China and Russia, and the most annoyed country by Venezuela, the one that is most at risk by a rogue regime sending waves of migrants away, along tons of drugs, the United States of America. In the end it is mostly China as Russia as no money to support the regime, or make war on its favor; Russia will be happy by throwing a bone their way in Syria or Ukraine. The Western hemisphere is just too strategic for the US, even more than Europe today. Having China take over is unacceptable. Excellent resúmen Daniel, this would be useful in Spanish as well, like your last post but I realize that's already asking too much. Crossing fingers that this is indeed the beginning of the end. Stay safe. Excellent summary Daniel. Going to forward it to my family who are reading uninformed reports. Venezuela is still screwed no matter what. If Guaidó remains a socialist, that means he won't have the balls or the economical knowledge to do the necessary reforms. The problem is socialismo itself, all the corruption and robbery that comes after is just a consequence of socialist ideas failing and people having to adapt to the distortions. The only hope is if that Guaidó go full doublethinking and decide that nothing is more socialist than the prosperity brought by free markets and respect for private property and contracts. Lets hope change-for the better- is coming; fast! Otherwise Guaidó would already be in jail. Not to say that Guaidó is like Juan Domingo Perón, but I am reminded of what happened in Argentina in 1945. The junta- of which Juan Domingo was a member- jailed him. Evita spearhead massive street demonstrations in Juan Domingo's favor. The junta soon released him from jail. Elections followed, which Perón won. I suspect that the reason Guaidó hasn't yet been jailed is that the regime fears such a street response. Not that they have read anything about Argentine history, mind you. Unfortunately (says he with irony) we are evitaless. I love how the mind of these criminal regimes work. Russia puts out a none interference message to the USA and world while at the same time bankrolling Venezuela, stealing assets and now sending in many Russian security agents to look after the regime. Plus they never stop interfering in politics around the world. Other countries need to step up especially Latin American ones. Cuba etc are openly aiding the none elected regime yet no one steps in to help the people or the new President. Now family and friends are calling me to figure out what is going on in Venezuela, they are all so confused such as Guaido extreme right etc. Good to have your website Daniel to reroute them. Thanks for real news. in any case what you write is corroborated from a reliable source; my wife is currently in the country. The EU ultimatum to Maduro that he has 8 days to call elections or else they will recognize Guaido is terrible. One the ultimatum itself is saying they recognize now that Maduro is the President. 2nd Maduro can use this to call elections months out and then steal them again, starting the whole process again. The article ends on the note: "To follow events in Venezuela, the two most reliable sources of information will be:...." and then, surprise, surprise. The best forecast I read on the likely outcome of the American presidential election. "To follow events in Venezuela, the two most reliable sources of information will be:...." and then, surprise, surprise. You weren't kidding about "surprise, surprise." I'm about to have a layover in Venezuela for 8hrs before heading to Istanbul. Any thoughts? Is the airport safe?